Diet and Good Gut Bacteria Could Epigenetically Change Your Gene Expression | What is Epigenetics? There are many different diets available in the nutritional world today that could dramatically adjust our gut bacteria, depending on what we consume. High-fat, low-carb diets, low-fat, high-carb diets, fasting, and cleanses are just a few examples of popular diets, and even what some may call “fads”, which might leave a person confused (and hungry). Maintaining dietary health is one of the most important factors in ensuring a long, prosperous life. Often times we forget to prioritize healthy eating habits and as a result, we could unknowingly skew the efficiency of the healthy bacteria living in our gut that aid in digestion and may influence our epigenome. In a recent study published in Nature Communications, a group of scientists from the Babraham Institute in Cambridge UK along with international colleagues suggest that diets high in fiber allow the good gut bacteria to prosper and potentially provide epigenetic protection against certain infections and cancers. “Our work illuminates how short chain fatty acids contribute to the regulation of proteins that package the genome and, thus, they affect gene activity,” stated Dr. Patrick Varga-Weisz, lead researcher of the study. Furthermore, the western diet – consisting of foods high in red meats, saturated fats, and empty carbs – has become normalized in our everyday lives, and studies show it could alter our epigenetics, potentially jeopardizing our own health and even the health of future generations. On the other hand, research has demonstrated that a ketogenic diet may be able to increase an epigenetic agent naturally produced in the body, improving memory defects in mice. In their study, the research team investigated the bacteria in the gut that break down complex carbohydrates that we eat into nutrients to fuel the cells in our body. Specifically, they focused on the effects that gut bacteria have on gene expression in the cells that comprise the gut lining. The team discovered that when fiber-rich foods – particularly fruits and vegetables – ferment in the colon, the gut bacteria produce chemicals called short-chain fatty acids (SCFAs) to supply energy to the colon-lining cells. Fiber is one of the key dietary components in maintaining a healthy digestive system and foods that are high in fiber include nuts, oatmeal, apples, and blueberries. The SCFAs produced by the gut bacteria, comprised of propionate, acetate, and butyrate, are involved in the metabolism of fats and carbs, and also hold an important role in moderating immune response. As a result, SCFAs may reduce the risk of developing hypertension, heart disease, type 2 diabetes, and obesity. Interestingly, the researchers also discovered that SCFAs directly increase the presence of an epigenetic mark called histone crotonylation, which is a mechanism that reverses the chromatin tightening effects of histone deacetylase 2 (HDAC2). Histone deacetylases are epigenetic enzymes that remove an acetyl group, which tightens chromatin to the point where transcriptional machinery cannot access it, limiting gene expression. Crotonylation is a process that enhances transcriptional activity by increasing the concentration of the enzyme crotonyl-CoA at the lysine, and has been implicated in the fight against HIV latency. This mechanism effectively loosens chromatin, allowing a greater amount of gene expression. The team treated a group of mice with an antibiotic cocktail for three days in efforts to reduce bacterial presence in the gut. After the three day period, they found that the mice experienced a decrease in histone crotonylation in the colon tissue and an increase in levels of HDAC2. Increased levels of HDAC2 in the gut have been linked to the development of colon cancer, highlighting the importance that healthy gut bacteria and regulated histone crotonylation may have on overall health. To further confirm their findings about the epigenetic effects of fiber-rich foods and short-chain fatty acids, the researchers employed cellular treatment with butyrate, which is an HDAC inhibitor, and also main component in SCFAs. They found that this treatment restored the promotion of histone crotonylation, implying that other HDAC inhibitors may be able to enhance the positive health benefits of SCFAs. The results also highlight the importance of keeping a healthy diet, as it can play a crucial role in not only our overall health, but may also influence our epigenetic marks which might be inherited by our future offspring. The scientists hope that additional studies will expand upon the effects of histone crotonylation and HDAC2 on gut health in efforts to create an environment in the gut that will leave the person less-susceptible to developing digestion-related diseases. 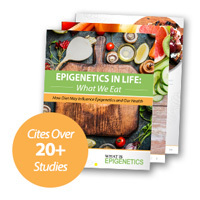 For more information on the influence that various foods might have on your epigenetics, please view our e-book Epigenetics in Life: What We Eat. Source: Patrick Varga-Weisz (2018) Microbiota derived short chain fatty acids promote histone crotonylation in the colon through histone deacetylases. Nature Communications, 9 (1). Reference: Babraham Institute. “How good bacteria control your genes: Chemical signals from gut bacteria influence gene regulation in the gut lining.” Babraham Institute News. 9 January 2018. Web.